Yesterday, December 5, 2013, was a big day. As I was running around yesterday doing errands and getting my hair cut and highlighted, I read the news that former South African president Nelson Mandela had passed away. I must admit that my knowledge of Mandela and his story in South Africa is pretty limited. I vaguely remember hearing as a child when he was released from prison (I was just seven years old at the time), but all I knew was that he’d been in jail for a really long time. I don’t remember hearing about what happened after that, though. It probably wasn’t until high school that he came onto my radar as the leader who led South Africa through ending apartheid. And that is still pretty much all I know about Mandela. After his term in office ended (just four years! ), he continued his works of activism and philanthropy, eventually “retiring from retirement” in 2004 due to his health problems. Clint Eastwood directed and produced the film Invictus (2009), which chronicles Mandela in his first term as the South African President and how he initiated a unique venture to unite the apartheid-torn land: enlist the national rugby team on a mission to win the 1995 Rugby World Cup. I’d not seen the film until just two weeks ago when we watched it one night in my grad school class (yep, back in school!). Now I get it, a little bit, the impact Mandela has on his country. So when I read the news that Mandela had passed away, I felt the heaviness and grief of not just South Africa, but the whole world. 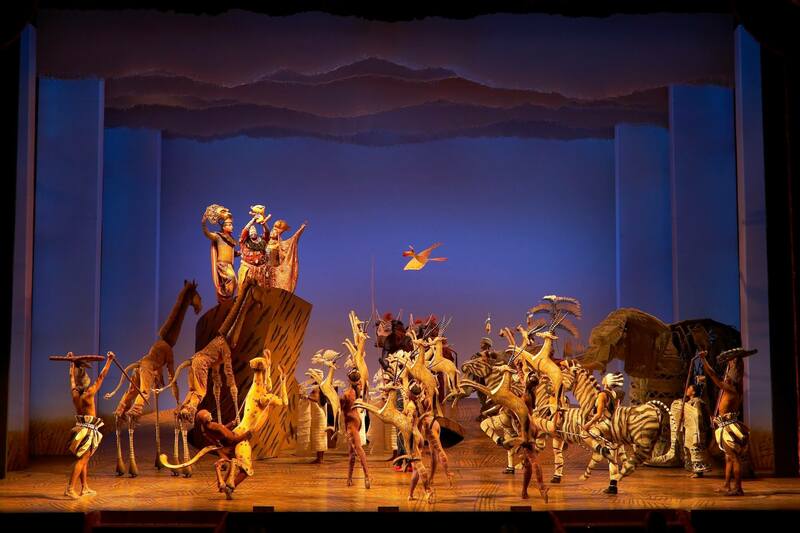 Fast forward through a hectic drive to Hollywood and an intimate meal with an old friend to 7:30pm which found me in literally THE most perfect seat in which to see Disney’s “The Lion King” on stage at the Pantages Theatre. With me were the aforementioned old friend (Nick), as well as my cousin and his wife (Nate and Sara). The show was truly fantastic. That opening note (you know the one) sent me into a wave of goosebumps, and the goosebumps remained throughout the rest of the song. It’s an overwhelming number, with emotions running the gamut, a spectrum of colors everywhere, a pulse-pounding score, and amazing puppetry. And that’s pretty much how the rest of the show went. 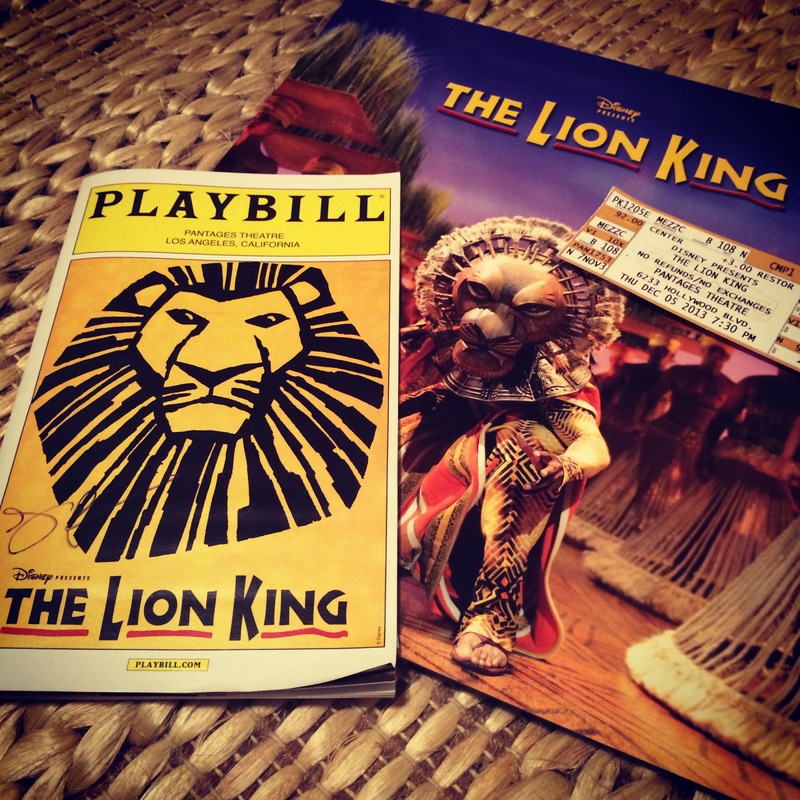 A friend of mine is in the touring cast, so that made seeing the show extra special. He is a member of the ensemble as well as the understudy for Banzai the Hyena. We messaged briefly during intermission, and when I told him I’d already teared up three times and was basically a mess of goosebumps the whole first act, he replied that that means the production is doing their job! When the show ended, the cast stayed onstage and did a brief call for donations to benefit local charities in Los Angeles and Broadway Cares, which was neat, especially going into the holiday season. Then the cast asked us all to stand with them while cast members from South Africa shared a brief farewell and sang the South African national anthem in honor of their beloved Madiba, Nelson Mandela. I felt honored to join them in celebrating Mandela and sending him off to rest in well-deserved peace. I am grateful for this quiet morning I’ve had to reflect and write about what happened yesterday. It was a wonderful way to kick off my birthday celebrations, and a fitting way to honor a great man. I will leave you with this: go see the show if it’s ever at a theatre close to you and be prepared to experience a beloved story in a new and fresh way, and be inspired and motivated by Mandela and the life he lived.